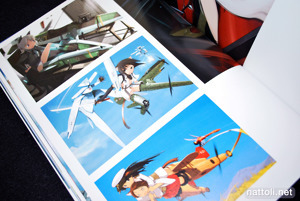 So while it might seem that all the girls in this book are from Strike Witches, it's just that they stem from Shimada's desire to use his Mecha Musume concepts across a variety of media. 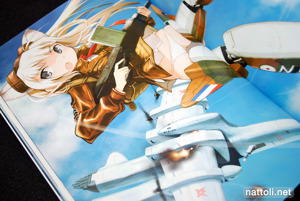 However, most of the girls at the front of the book really are from Strike Witches, and this art book is definitely the largest collection from Strike Witches available right now. 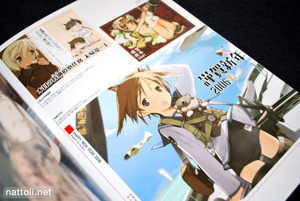 Though initially, Strike Witches just seemed like the most hilarious premise to have girls without pants on, there was thankfully more to it than that. 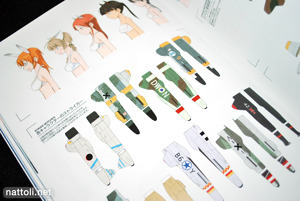 But the designs are definitely about the no pants ^^; Though I like the anime adaptation designs by Kazuhiro Takamura I prefer Shimada's art style for the characters. 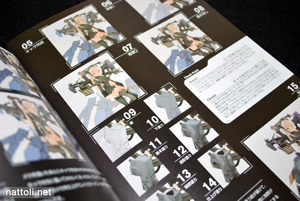 I felt this book was all over the place with its page layouts. Some pages have full page images, others even have spreads. But for the most part, the art work is tiled, two, three and sometimes more images to a page. While some of the art work is simple with no background art, others are pictures that would have benefited from a larger canvas. Several of the tiled art works are from the commercial break eye-catchers that aired during the anime. So it's really possible that they just weren't illustrated very large to begin with. 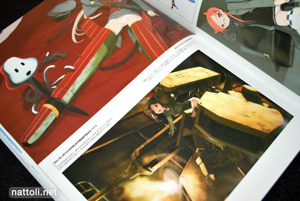 But that's unlikely ^^; So yeah, all the eye-catchers from the anime are included in the book. 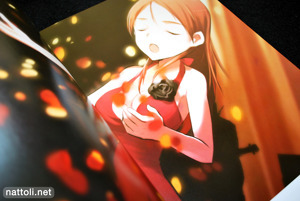 Shimada Humikane Art Works is 112 pages long, and A4 in size. 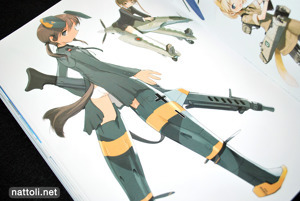 I would say about 47 pages of that is solidly Strike Witches art work, though they do appear a couple of times more in the rest of the book, just not with any consistency. One of the things I disliked is that there are a lot of character profile pages, 12 pages total including the chibi forms of the girls. It would be fine normally, but the images are really small fitting anywhere from 3 to 7 characters on a page. After the Strike Witches section, there's a lot more of the commissioned art work that Shimada did for other shows as well. There's a really nice version of Rider from Fate/Stay Night as well as the illustration he did of Hazuki from Tsukuyomi Moon Phase that appeared as an extra with on of the DVD releases. 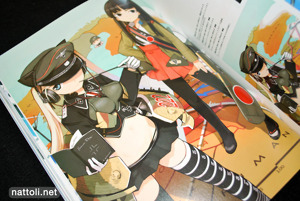 His illustration for Megami Magazine Creators Vol. 01 is also in there. There's also art work from Tristia of the Deep Blue Sea. I'm surprised how many artists have drawn those characters at some point, I never thought it was popular as an anime, but it must have been a great game ^^; Shimada's girls look great, even when they're not in mecha form. 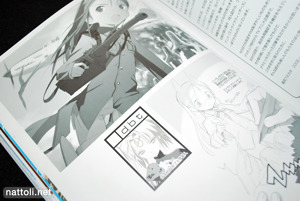 Shimada Humikane Art Works doesn't waste space on an index, instead the author's comments and the image copyright information was next to each of the illustrations in the book. 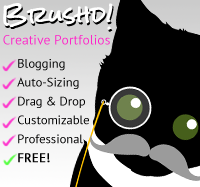 I kind of like it better that way, because you can fit more art work in. 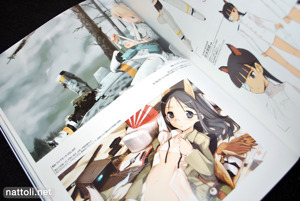 This book can be a bit hard to get---it was re-printed in March 2009 after they completely sold out in October last year... only to sell out again in March ^^; But it's definitely worth collecting, as I don't expect many more books by the father of Mecha Musume. 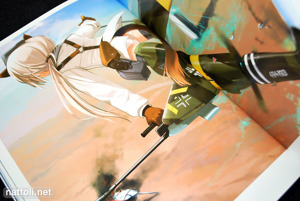 Very nice, love strike witches. Thinking of buying this one, thanks for the review, really appreciate seeing before buying! Does anyone know if there will be another season???!?!?!?!?!?!?!!? !